Legg-Calvé-Perthes disease (LCPD) is an idiopathic juvenile avascular necrosis of the femoral head in a skeletally immature patient, i.e. children. Legg-Calvé and Perthes discovered this disease approximately 100 years ago. The disease affects children from ages of two to fourteen. The disease can lead to permanent deformity and premature osteoarthritis. LCPD is a hip disorder which is caused by an interruption of blood supply to the femoral head. As the blood vessels around the femoral head disappear and cells die, the bone also dies and stops growing. When the healing process begins, new blood vessels begin to remove the dead bone. This leads to a decrease in bone mass and a weaker femoral head. It can also lead to deformity of the bone due to new tissue and bone replacing the necrotic bone. The bone death appears in the femoral head due to an interruption in blood supply. As bone death appears, the ball develops a fracture of the supporting bone. This fracture indicates the outset of bone reabsorption by the body. As bone is slowly absorbed, it is replaced by new tissue and bone. Other names are: ischaemic necrosis of the hip, coxa plana, osteochondritis and avascular necrosis of the femoral head. Many aspects of the disease remain unknown or are unclear, including etiology but many factors may be involved including gender, genetics, socioeconomic status and environment. Also the pathophysiology of best methods for treatment of patients in different age groups affected with the disease is unclear. 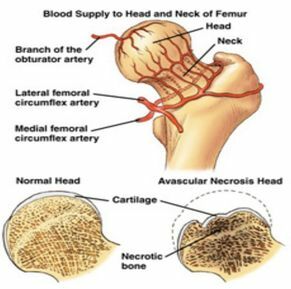 The femoral head is supplied with blood from the medial circumflex femoral and lateral circumflex femoral arteries, which are branches of the profunda femoris artery. The medial femoral circumflex artery extends posteriorly and ascends proximally deep to the quadratus femorus muscle. At the level of the hip it joins an arterial ring at the base of the femoral neck. The lateral femoral circumflex artery extends anteriorly and gives off an ascending branch, which also joins the arterial ring at the base of the femoral neck. This vascular ring gives rise to a group of vessels which run in the retinacular tissue inside the capsule to enter the femoral head at the base of the articular surface. There is also a small contribution from a small artery in the ligamentum teres to the top of the femoral head which is a branch of the posterior division of the obturator artery. LCPD is an idiopathic disease, but a variety of theories about the underlying cause have been proposed since its discovery over a century ago, ranging from congenital to environmental and from traumatic to socio-economic causes. LCPD has been associated with thrombosis, fibrinolysis, and abnormal growth patterns of the bone. It has also been associated with an abnormality in the Insulin-like Growth Factor-1 Pathway, repeated mircotrauma or mechanical overloading related to hyperactivity of the child or a very low birth weight or short body length at birth. Some studies suggest a genetic factor, i.e. a type II collagen mutation, and other studies report maternal smoking during pregnancy as well as other prenatal and perinatal risk factors. It may be be that LCPD requires a set or subset of the aforementioned causes. As of yet it is hard to discern which are determining or merely contributing factors to the onset of the disease. The pathogenesis of osteonecrosis is becoming better understood. Most research suggests either a single infarction event with subsequent mechanical loading that further injures and/or compresses the vessels during the repair process or multiple episodes of infarction are required to produce LCPD. The key pathological event associated with the initiation of the development of LCPD is disruption of the blood supply to the capital femoral epiphysis. Subsequently ischaemic necrosis occurs in the bone, marrow and cartilage of the femoral head which results in a cessation of endochondral ossification and decreased mechanical strength (fig.2). When mechanical loading surpasses the weakened head’s capacity, deformity is initiated and progresses due to resorption of the necrotic bone and asymmetric restoration of endochondral ossification. Fig.2: Summary of the pathogenesis of femoral head deformity following ischemic necrosis. The reported incidence of LCP disease differs between countries and varies from 4 to 32 per 100,000, with a male to female ratio of 5:1. There is substantial ethnic variation, with Caucasians being more affected than other ethnicities and the condition generally presenting at an older age in children from India. In addition to racial differences, the incidence also varies depending on socioeconomic class, with the incidence being higher in less densely populated areas and in lower socioeconomic classes. LCPD classification may be divided into three categories: those defining the stage of the disease, those attempting to prognosticate outcome, and those defining outcome. The progression of LCPD was classified over 4 stages by Waldenström in the early 20th century; Joseph et al. modified the Waldenström classification system by further classifying each of the first three stages into early (A) and late (B) substages in order to determine when various changes occur during the evolution of the disease. Disruption of the blood flow causes osteonecrosis. Radiolucency of the femoral head. A subchondral fracture line could be visible. Dead bone is resorbed causing higher degree of fragmentation. The newly-formed bone gradually fills in towards the central area. The appearance of the bone in the femoral head looks similar to the normal side. It is homogeneous, however, can be enlarged (called coxa magna), flattened (coxa plana), and have a short, broad neck (coxa breva). The final shape of the femoral head at this stage (the degree of flattening or deformity) and how it fits the socket largely determines the long-term outcome. Fig. 3: The modified Waldenström classification system for staging of Legg-Calvé-Perthes disease. A detailed visual and textual representation of the full, seven-stage classification system covers the disease process from early sclerosis (stage IA) to fully healed (stage IV). AP = anteroposterior. 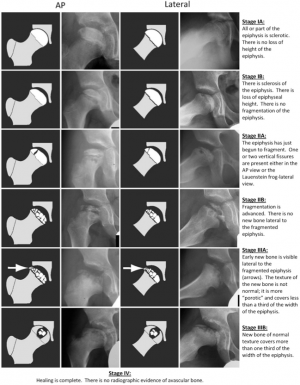 The first classification to be widely used is the Catterall Classification which differentiated the hips into four groups based on radiographic appearance of the femoral epiphysis, i.e. the level of visible involvement of the femoral head in osteonecrosis. Catterall suggested that groups 1 and 2 were benign, requiring symptomatic treatment whilst groups 3 and 4 had more extensive head involvement with less favourable outcome. In addition he described four “at risk signs” that indicated poor prognosis (Gage sign, calcification lateral to the epiphysis, lateral subluxation and the angle of the epiphyseal line). Reports of interobserver reliability differ strongly from article to article and there are inconsistencies on the cut-off points between classes. Herring et al proposed a classification based on the height of the lateral pillar of the femoral head. 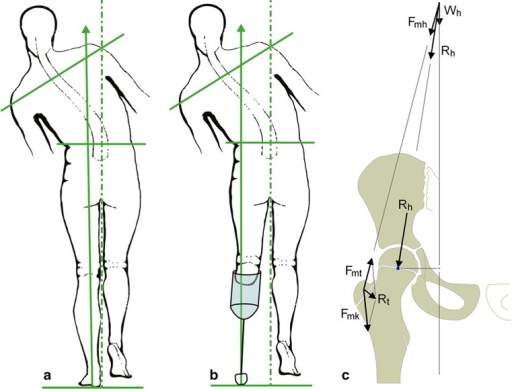 Hips are classified during the fragmentation stage into three groups; Group-A hips are defined as those with no involvement of the lateral pillar, with no density changes and no loss of height of the lateral pillar, Group-B hips have lucency in the lateral pillar and may have some loss of height, but not exceeding 50% of the original height. Group-C hips are those with more lucency in the lateral pillar and >50% loss of height. Later a border Group-B/C was added, defined as greater than 50% of the lateral pillar height, with a narrow column (2–3 cm), or approximately 50% of pillar height maintained, but depressed relative to the central pillar. Although all three systems have inconsistent reports on reliability, on balance the Modified Lateral Pillar Classification is the most reliable due to its ease of use and clear characteristics. Stulberg classified LCPD based on the shape of the femoral head and the congruency of the hip joint. Prognostic studies have reported the classification to be a reliable predictor for long term outcome. In hips in this category osteoarthritis does not develop. Stulberg 1: Normal Spherical Head. Stulberg 2: Spherical head with coxa magna/breva or steep acetabulum. Mild to moderate osteoarthritis develops in late adulthood in these hips. Stulberg 5: Severe osteoarthritis develops before the age of fifty years in these hips. According to a research article in the Journal of Bone and Joint Surgery, the strongest predictor of prognosis is the revised lateral pillar classification. Regardless of treatment strategy all group A hips and an overwhelming majority of group B hips have favourable results. The B/C border group has moderate results and all group C hips have poor results. The second strongest predictor of outcome is age at the onset of the disease. An age of six years or less at the onset of the disease is usually, but not always, associated with a benign course and a good outcome. Children between the ages of six and eight years at the onset of the disease are considered to have a variable prognosis and are thought to benefit from treatment. Patients who are eight years or older at the time of onset generally have poorer outcomes, albeit a better outcome with surgical treatment than they do with non-operative treatment. In other studies, good prognosis of a child with this disease under the age of eight has been shown to be up to 80%. This is with minimal treatment given to the patient. In this study, children between the ages of 4 and 5 and 11 months had a less favourable chance of a good outcome. LCPD is present in children 2-13 years of age and there is a four times greater incidence in males compared to females. The average age of occurrence is six years. Limp: A psoatic limp is typically present in these children secondary to weakness of the psoas major. The limp: is worse after physical activities and improves following periods of rest. The limp becomes more noticeable late in the day, after prolonged walking. Pain:  The child is often in pain during the acute stages . The pain is usually worse late in the day and with greater activity. Night pains are frequent. ROM: The child will show a decrease in extension and abduction active ranges of motion. There is also a limited internal rotation in both flexion and extension in the early phase of the disease . Unusual high activity level:  Children with LCPD are usually physically very active, and a significant percentage has true hyperactivity or attention deficit disorder. Septic arthritis or infectious arthritis: this is an infection of the joint. Transient Synovitis of the hip is a self-limiting condition in which there is an inflammation of the inner lining (the synovium) of the capsule of the hip joint. Hip Labral Disorders: The hip labrum is a dense fibrocartilagenous structure, mostly composed of type 1 collagen that is typically between 2-3mm thick that outlines the acetabular socket and attaches to the bony rim of the acetabulum. Hip labral disorders are pathologies of this structure. Juvenile Rheumatoid Arthritis : a chronic inflammatory disorder that occurs before the age 16 and can occur in all races. A MRI is usually obtained to confirm the diagnosis; however x-rays can also be of use to determine femoral head positioning. Since LCPD has a variable end result, an imaging modality that can predict outcome at the initial stage of the disease before significant deformity has occurred is ideal. To quantify femoral head deformity in patients with LCPD novel three dimensional (3D) magnetic resonance imaging (MRI) reconstruction and volume based analysis can be used. The 3D MRI volume ratio method allows accurate quantification and demonstrated small changes (less than 10 percent) of the femoral head deformity in LCPD. This method may serve as a useful tool to evaluate the effects of treatment on femoral head shape. The questionnaires below can be used to assess the initial function of a person and progress and outcome of operative as well as non-operative treatments. The surveys test the patient on a functional level are useful to provide a baseline and monitor functional progress in the patient’s activities. As for the difference in outcome for non-operative and operative treatments, a meta-analysis performed in 2012 suggests that operative treatment is more likely to yield a spherical congruent femoral head than non-operative methods among six-year-olds or older. For patients who are younger than the age of six, operative and non-operative methods have the same likelihood to yield a good outcome. Children who were six years or older who were treated operatively had the same likelihood of a good radiographic outcome regardless of surgical intervention with a femoral or pelvic procedure. Patients younger than six had a greater benefit from pelvic procedures than femoral procedures. 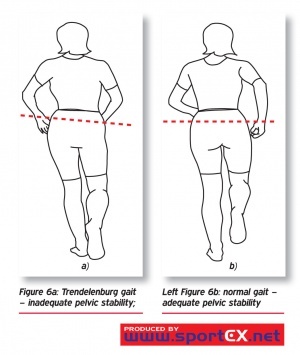 The restriction of hip motion is variable in the early stages of the disease. Many patients, may only have a minimal loss of motion at the extremes of internal rotation and abduction. At this stage there usually is no flexion contracture. Loss of hip ROM in patients with early LCPD without intra-articular incongruity is due to pain and muscle spasm. This is why, if the child is examined for instance after a night of bed rest, the range will be much better then later in the day. Further into the disease process, children with mild disease may maintain a minimal loss of motion at the extremes only and thereafter regain full mobility. Those with more severe disease will progressively lose motion, in particular abduction and internal rotation. Late cases may have adduction contractures and very limited rotation, but the range of flexion and extension is only seldom compromised. Pain occurs during the acute disease. The pain may be located in the groin, anterior hip area, or around the greater trochanter. Referral of pain to the knee is common. It’s recommended that pain is assessed using the Numerical Rating Scale (NRS). In most cases there is atrophy of the gluteus, quadriceps and hamstring muscles, depending upon the severity and duration of the disorder. The approach to treatment is controversial. Prior to evaluating if a surgical intervention is necessary, there has to be a clear understanding of the disease prognosis. Approaches to treatment can be divided in conservative or operative treatments. Medications include non-steroidal anti-inflammatories (NSAIDs) for pain and/or inflammation. Psychological factors are also considered. Persons with a history of LCPD are 1.5 times more likely to develop attention deficit disorders compared to their peers. They also have a higher risk of developing depression. There is no consensus concerning the possible benefits of physiotherapy in LCPD, or in which phase of the development of the health problem it should be used. Some studies mention physiotherapy as a pre- and/or postoperative intervention, while others consider it a form of conservative treatment associated with other treatments, such as skeletal traction, orthesis, and plaster cast. Passive mobilisations for musculature stretching of the involved hip. Straight leg raise exercises, to strengthen the musculature of the hip involved for the flexion, extension, abduction, and adduction of muscles of the hip. They started with isometric exercises and after eight session, isotonic exercises. A balance training initially on stable terrain, and later on unstable terrain. For children over 6 years at diagnosis with more than 50% of femoral head necrosis, proximal femoral varus osteotomy gave a significantly better outcome than orthosis and physiotherapy. Physical therapy interventions have been shown to improve ROM and strength in this patient population (3). Individuals who participate in supervised clinic visits demonstrate greater improvement in muscle strength, functional mobility, gait speed, and quality of exercise performance than those who receive a home exercise program alone or no instruction at all (2). Begin with isometric exercise and progress to isotonic exercises in a gravity lessened position with further progression to isotonic exercises against gravity. It is appropriate to include concentric and eccentric contractions (3). Local consensus would also do exercises to improve balance and gait and interventions to reduce pain. The rehabilitation is described with reference to the various stages of rehabilitation. Gait training with the appropriate assistive device, focusing on safety and independence (5). It is recommended that activities outside of PT are limited to swimming if the referring physician allows (5). Note: Running and jumping activities are restricted at this time (5). It is recommended that activities outside of PT include swimming and bike riding as guided by the referring physician (5). Progress isotonic exercises of the hip, knee, and ankle and include concentric and eccentric contractions (3). WB and NWB activities used in combination based on the patient’s ability (4) and goals of the treatment session. In August 2016 researchers from the Universities of Liverpool and Manchester have been awarded £278k to help investigate the best surgical treatments for hip diseases in childhood. 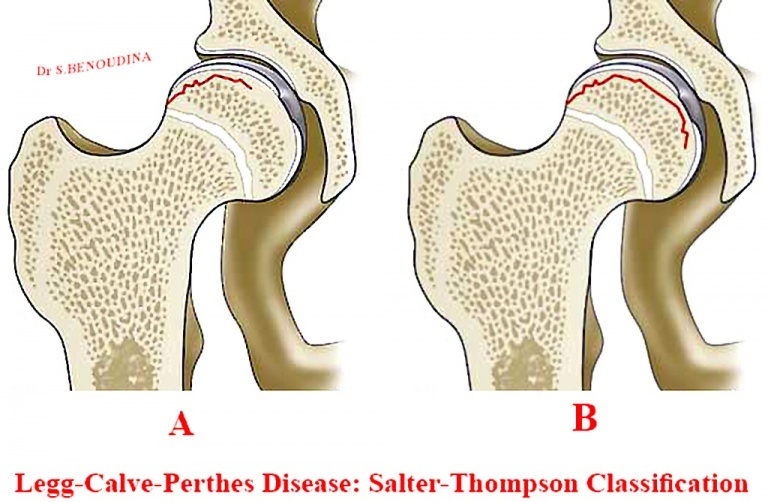 It will focus on people with two common hip diseases, LCPD and Slipped Capital Femoral Epiphysis (SCFE). Using measurements of the hip and clinical symptoms the researchers will develop methods to predict likely outcomes of the disease, and to choose the most appropriate treatment. Legg-Calve-Perthes Disease is an idiopathic juvenile avascular necrosis resulting in malformation of the femoral head. It’s a self healing condition and the long term outcome and therapy strongly depends on the severity of the osteonecrosis and the ultimate shape of the femoral head. Although more prevalent amongst males, females generally have worse outcome as well as do older children compared to younger ones. There is next to no empirical evidence due to a lack of experimental research and the therapies prescribed are mostly based on heuristic models. Treatments generally attempt to maintain and improve range of motion and strength as well as manage pain. ↑ Johansson T, Lindblad M, Bladh M, Josefsson A, Sydsjö G. Incidence of Perthes’ disease in children born between 1973 and 1993: A Swedish nationwide cohort study of 2.1 million individuals. Acta orthop 2017;88(1):96-100. ↑ Kim HK. Pathophysiology and new strategies for the treatment of Legg-Calvé-Perthes disease. J Bone Joint Surg Am 2012;94(7):659-69. ↑ 6.0 6.1 Hunter JB. (iv) Legg Calvé Perthes’ disease. Curr Orthopaed 2004;18(4):273-83. ↑ 7.0 7.1 Kim HK. Legg-Calve-Perthes disease: etiology, pathogenesis, and biology. J Paediatr Orthoped 2011;31(2)141-146. ↑ 11.0 11.1 Hyman JE, Trupia EP, Wright ML, Matsumoto H, Jo CH, Mulpuri K, Joseph B, Kim HK. Interobserver and intraobserver reliability of the modified Waldenström classification system for staging of Legg-Calvé-Perthes disease. J Bone Joint Surg Am 2015;97(8): 643-650. ↑ Joseph B. Natural history of early onset and late-onset Legg-Calve-Perthes disease. J Pediatr Orthop 2011; 31(2): S152–S155. ↑ Catterall, A. Natural history, classification, and x-ray signs in Legg-Calvé-Perthes' disease. Acta orthop Belg 1980;46(4): 346. ↑ Salter RB, Thompson GH. Legg-Calve-Perthes disease. The prognostic significance of the subchondral fracture and a two-group classification of the femoral head involvement. J Bone Joint Surg Am 1984;66(4): 479-489. ↑ Herring JA, Neustadt JB, Williams JJ, Early JS, Browne RH. The lateral pillar classification of Legg-Calve-Perthes disease. J Pediatr Orthop 1992;12(2): 143-150. ↑ Herring, JA, Kim HT, Browne R. Legg-Calve-Perthes disease. Part I: Classification of radiographs with use of the modified lateral pillar and Stulberg classifications. J Bone Joint Surg Am 2004;86(10): 2103-2120. ↑ Stulberg SD, Cooperman DR, Wallensten R. The natural history of Legg-Calve-Perthes disease. J Bone Joint Surg Am 1981;63(7): 1095-1108. ↑ Binkley JM, Stratford PW, Lott SA, Riddle DL. The lower extremity functional scale (LEFS): scale development, measurement properties, and clinical application. Phys Ther 1999;79:371-383. ↑ Nguyen NA, Klein G, Dogbey G, McCourt JB, Mehlman CT. Operative versus nonoperative treatments for Legg-Calvé-Perthes disease: a meta-analysis. J Pediatr Orthop. 2012;32(7):697-705. doi:10.1097/BPO.0b013e318269c55d. ↑ Sallam A, Ziegler CM, Jansson V, Heimkes B. The underused hip in ipsilaterally orthotics-dependent children. "J child orthop 2015;9(4):255-262. ↑ Robben SG, Lequin MH, Meradji M, Diepstraten AF, Hop WC. Atrophy of the quadriceps muscle in children with a painful hip. Clin Physiol. 1999 Oct;19(5):385-93. ↑ Hailer YD, Nilsson O. Legg-Calvé-Perthes disease and the risk of ADHD, depression, and mortality: A registry study involving 4057 individuals. Acta orthop. 2014;85(5):501-5.